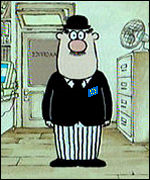 Bloggers4UKIP: Hector the EU tax inspector? If you want another example of how the EU is interfering in every tiny little aspect of our lives, here it is. Remember we joined a Common Market. We were told that joining the Common Market did not affect British Sovereignty in any way. It was for this reason that Edward Heath said in 1972 that a referendum was not necessary on joining the Common Market. Every day, yet another reason emerges to convince me that it's time to leave this once pleasant land. May all these tyrants be injected with their swine flu vaccines and suffer the consequences.